The Hyde Drift Boat research and development team continue to set the bar in the industry for craftsmanship, design and value. We have earned our reputation by producing the most durable and innovative drift boat products in the world. We invest a tremendous amount of time and resources developing products such as our Modular Design, the G4 Bottom©, 3-Point Leg Brace©, rigid raised level floors, recessed rod holders, and many other innovations that provide the ultimate fishing experience for you, our customer. The hull design of our boats remains the top priority in our research and development efforts. Our reputation of being the easiest rowing boat is important to you and to us. With that in mind, we are continually developing new technology to further improve the “row ability” of our drift boats. The following article is a brief overview of how river conditions affect a rower’s ability to maneuver a drift boat. 1. We’ll talk about hydrodynamics, turbulence, and drag. We’ll first touch on what they are and how each can make or break a drift boat design. 2. We’ll show off the technology Hyde has developed along with the sound engineering concepts we currently use in our innovative boat designs. 3. Finally, we will review a few concepts currently used by other manufacturers in their drift boat designs that we have found to be invalid. 1. One key to a successful boat is developing and engineering a design to allow the waters unrestricted movement under your hull in a laminar flow. This is important because natural friction or “drag” is created between the water and any boat hull. Laminar flow conditions produce less drag than turbulent flow conditions. Maintaining a laminar flow under your boat is mandatory to reduce drag, and ultimately makes it easier and safer for you to row and maneuver your boat. The following is an overview of the proven technology and engineering practices we use at Hyde Drift Boats to promote laminar flow under our boats and reduce the drag. 2. We have developed a rounded stern on all of our fiberglass drift boats, this allows water to continue its flow under the boat with little interruption, thus promoting greater laminar flow conditions. 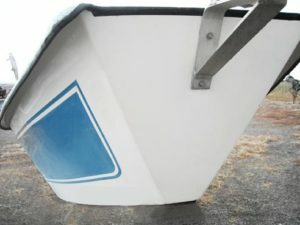 In general, drift boat hulls are unique to other boat types because the stern is the leading edge as water passes under the boat. 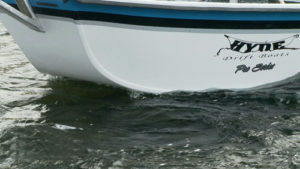 Water flows under a drift boat in a direction from stern to bow and that undisturbed entry and exit is necessary for the reduction of drag. (see diagram to left – click to enlarge). Sharp or blunt sterns on a drift boat add to turbulence and reduce the good laminar flow required for maximum performance. Flat sterns or any added groove, tunnel, or pock disrupts the fragile laminar flow resulting in more drag and turbulent flow. Because of that turbulence the rowers ability to hold the boat against the water flow would be reduced, resulting in the angler having less time to cast to that big fish. Engineering research has shown that a smooth transition at the stern and continuing across the boat bottom removes turbulent flow and unwanted drag. At Hyde Drift Boats we take the time to study and implement these engineering details, and are the only drift boat manufacturer currently using all of these latest advances in technology. 3. Tunnels are used on many power boats and are located at the rear of the boat or the waters exit point. One key detail to remember is that the water exit point on a drift boat is actually the front of the boat (the bow). While the concept of a tunnel works well for power boats, it only further disrupts water flow when used on a drift boat. 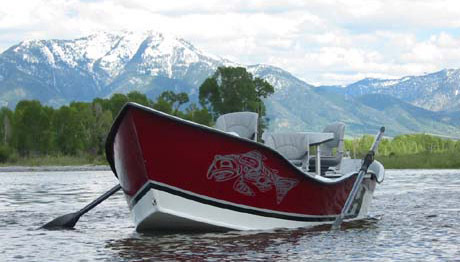 We use flat, rigid bottoms on all Hyde Drift Boats. As the water flows under a drift boat it creates a buoyancy force pushing the boat upward. Drift boats with flexible bottoms can turn laminar flow into turbulent flow by the up and down movement of the boat hull. That up and down motion also creates fatigue to the resins used in the boat which in turn result in a shorter life of the boat structure. Since the goal of a drift boat is to create minimal disruption to the water flow, keeping the boat bottom firm and rigid is important in creating less drag and improving the overall performance of the boat. The importance of a rigid hull in any boat is best explained by thinking of rigid hulls in power boats. Just imagine a power boat with a flexible hull and the drag or instability that it would create. The principle is the same, rigid hulls make better boats be they power boats or drift boats. This is especially true when the hull is the floor as is the case with some drift boats. Another important element commonly overlooked in drift boat design, are the boats chines. At Hyde Boats we use sharp angled chine’s which allow you to control the boat much like the sharp edge on a ski. Sharp chines on your drift boat are like having low profile Z rated tires on your car. They offer the best solution for performance and control.